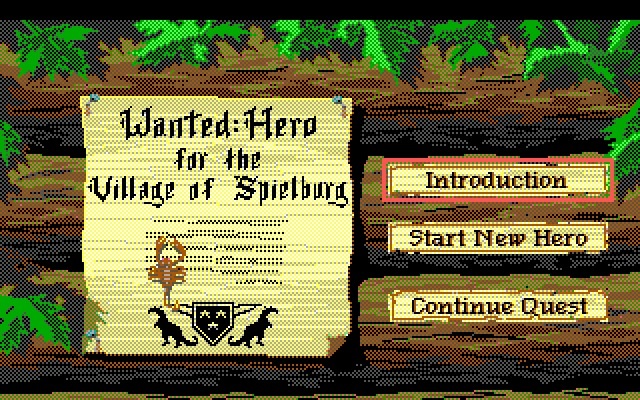 In the game's main menu, you can play the Introduction (followed by creating a new character and starting a new game), start a new hero (without viewing the introduction), or Continue your Quest (restore a saved game). For fun, right-click the scorpion to "find the first bug" in the game. While playing the game, press ESC to access the in-game menu. About Glory I (CTRL-G): displays the game credits and game version. 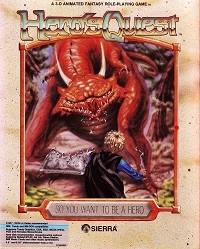 File: Here you can save (F5), restore (F7), restart game (F9) or quit (CTRL-Q) the game. Game: Here you can increase (+) or decrease (-) animation or set it to normal speed (=). You can also change the sound volume (CTRL-V) or enable/disable the sound (F2). Cast Spell (CTRL-C): can both be used from a distance or in close combat. Fight (CTRL-F): sometimes you need to take the fight to the creature. Escape (CTRL-E): when you're in a fight and you want to run away before it ends. Note that the monster will try to chase you still and some of them are fast! Information: Here you can access your inventory (CTRL-I) or your character sheet (CTRL-S). You can also inquire about the time and day it is (CTRL-T), print "Ask about" (CTRL-A) or "Look at" (CTRL-L) in the command line. Note that you can also look at people or objects by right-clicking the mouse on it.